The Liberal Democrats have announced their tax plans for the election. 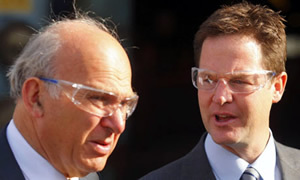 Here we bring you reaction to Vince Cable and Nick Clegg’s ideas from around the blogs. The Liberal Democrats announced their tax platform for the next election yesterday. The headline grabbing number is £10,000. Under the proposals, that is the amount that anyone is going to be able to earn before they start paying income tax. This will be paid for by green taxes, particularly on aviation, restricting tax relief on pensions for better off people, increases in capital gains tax, closing tax loopholes and perhaps most controversially a 1 per cent tax on all who own houses worth more than £2 million. This is an adapted form of Vince Cable’s “mansion tax” (it was previously 0.5 per cent starting at £1 million) that was floated during the Lib Dem conference in September this year. “Our plans represent the most radical, far reaching tax reform in a generation. Stephen Tall, writing on Lib Dem Voice yesterday, pointed out that whilst Susan Kramer, fighting off a challenge from the Conservative Zac Goldsmith in Richmond Park where lots of wealthy people live was “less than enamoured” of the original mansion tax proposal; she tweeted yesterday that starting the threshold at £2 million was “fair”. So perhaps an acceptable middle ground has been found to pitch this policy. Stephen also points out that the policy could turn out to be very popular with three quarters of the British public supporting Vince’s original proposal. This seems to rather wilfully ignore three recent polls which suggest that there could be a hung parliament after the next election. If the polls continue in this vein and perhaps even narrow as we get closer to an election as they usually do then in reality Mr Dale and many others from across the political spectrum will have to pay close attention to the Lib Dem position on tax. It could be the first time in a long while that that is the case and this makes yesterday’s progressive tax announcements from the third largest party all the more important. So Dale thinks the tax proposals are “mired in Lib Dem politics rather than economic”. Using economic policy for political purposes. Scandalous. Never happen in the Tory party. Polls don’t narrow before general elections in the UK. That is a myth. On observed phenomenon is an increase of LibDem support during the election month. This can be seen even in 1997 (c.f. “The Labour Landslide”).